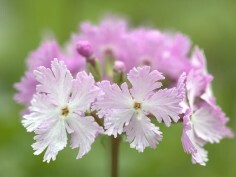 Primula sieboldii is a native of eastern Siberia, Manchuria, Korea and Japan where it grows in light woodland and damp meadows, its creeping rootstock building up the plant into large clumps. The leaves are pale green, wrinkled and covered in short hairs. 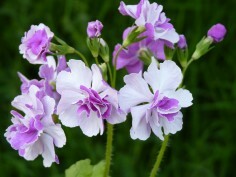 In Japan it has been bred and cultivated as a garden flower from at least the sixteenth century. The Japanese call it Sakurasoh - the cherry blossom herb-because the flowers resemble cherry blossom and appear just as the blossom is falling. Flowers may be smooth and round as a penny, or fringed like extravagant lace, or of the most exquisite snowflake patterns. Carpet the earth with them. Cut them by the armful - they have stems like sweet peas, last fully a fortnight in water and are sheer magic by lamplight.